If you thought reverse parallel parking an articulated lorry was tricky in Euro Truck Sim, wait until you try doing it in a bog, using a camera that cannot decide whether to help or hinder you. 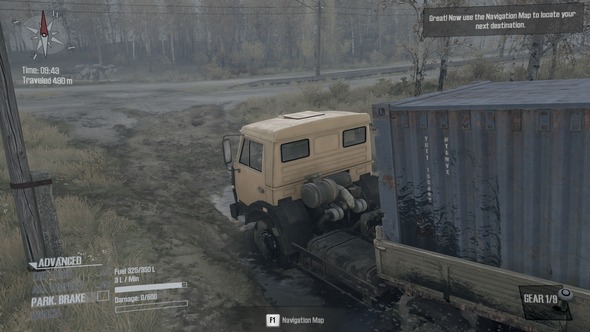 That is actually Spintires: MudRunner’s USP, as bizarrely specific as it is. 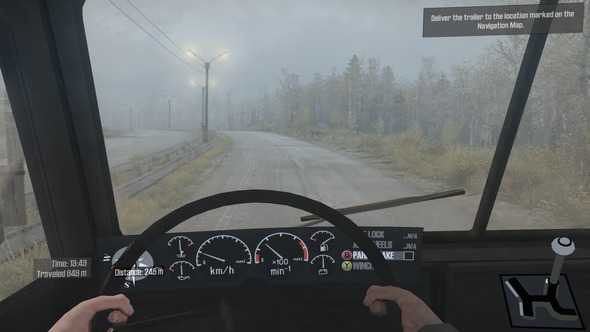 The fundamental appeal is the same as it was for the first Spintires: churning mud, heavy trucks and trailers, and road networks that are entirely inappropriate for haulage routes. If I lived on a dirt road and I saw one of Reg Vardy’s fleet trying to make its way down it, using the tree in my front garden as an anchor point for a winch, I would be writing a letter to my MP. But I digress. 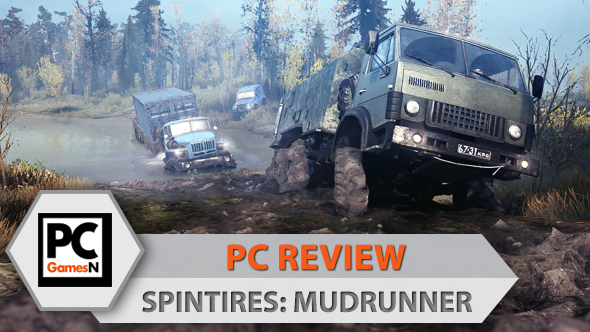 As clichéd and lazy as it may be to raise this point, your enjoyment of Spintires: MudRunner really does hinge entirely on whether that first paragraph read like a fascinating challenge or an exercise in tedium to you. The enjoyment on offer here is, as with any simulator really, wholly about doing the thing. Not about unlocking bigger and better things, although there is some of that for progression’s sake. Not about throwing you into increasingly spectacular or high-stakes scenarios. It is purely about making your way through loose surface roads in heavy vehicles. Or, as the game itself puts it, a ‘physics playground’ like Beam.NG Drive with a slightly straighter face. It is good at this, too. In a field of exactly one, it really is the Lebron James of dragging lorries through puddles and rolling 4x4s down hills, thanks to its real-time deformation tech (similar to that of Milestone’s unappreciated MXGP series). 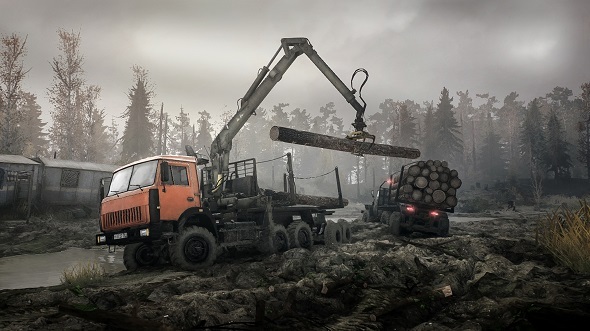 Falling somewhere between a ‘definitive edition thingy’ and a sequel, MudRunner brings a new Challenge mode to the existing sandbox gameplay, adding specific routes and constraints, like getting logs from A to B without causing damage or driving like a lunatic. That arrives alongside 13 new vehicles, all of which you will get irreparably stuck in churned up mud while trying to line up your trailer at a drop-off point, on account of that real-time mud modelling. I will hold my hands up and say I am baffled by this component of the game. If you mess up a reverse trailer park a few times – and let’s face it, you will – the surface underneath your vehicle degrades to the point that it offers no traction at all. At that point, only a winch can save you, and if there is nothing to attach that winch to in the vicinity… game over. It feels like falling down a big hole in an action game, which doesn’t quite kill you, but also offers no way out. The camera is MudRunner’s biggest problem, though. Faced with the problem of showing you a massive truck and trailer at an angle you can control them at, it offers no satisfactory solution. There is only a first-person view with no working mirrors, or an oddly close third-person cam, controlled by the mouse, which you also use to affix winches and detach trailers using a static view. Fiddly isn’t even the word.